New Delhi: Bollywood powerhouse, Ayushmann Khurrana is on a roll. After delivering back to back blockbusters like 'AndhaDhun' and 'Badhaai Ho', the actor will soon treat his fans with his upcoming film ‘Article 15’. “Wrapped up a film which will become the most relevant and important film of Indian cinema. Thank you @anubhavsinhaa sir for giving me this gem and also writing the most realistic cop role ever. Thanks to the entire cast and crew, esp @ronjinichakraborty and @ashishsverma for this wonderful 3D mini model of mine. Love. It’s a wrap! # Article15,” he wrote alongside a picture featuring the 3D mini model of him. Anubhav Sinha is helming the upcoming investigative drama. Anubhav had last directed and produced the critically acclaimed Rishi Kapoor and Taapsee Pannu starrer ‘Mulk’. 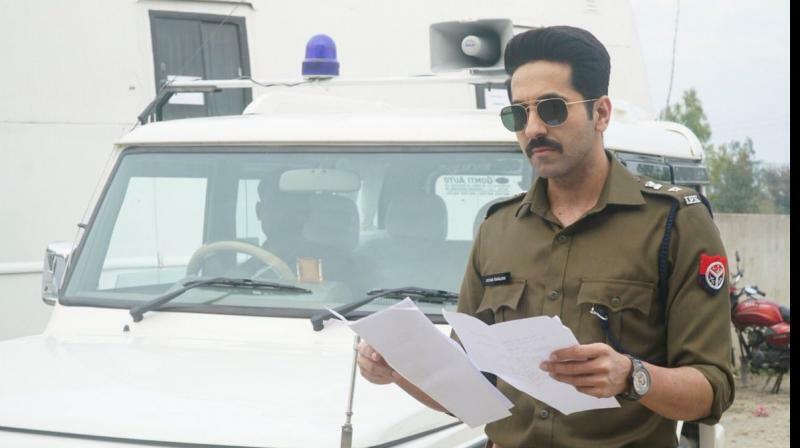 Ayushmann, who has managed to make his mark in the Bollywood industry with his diverse choice of cinema, from sperm donor to a blind man, will be seen essaying the role of a police officer for the first time in this film. While Khurrana will essay the role of the principal protagonist, he will be joined by a stellar support cast comprising of Isha Talwar, Manoj Pahwa, Sayani Gupta, Kumud Mishra, M Naser, Ashish Verma, Sushil Pandey, Subrajyoti Bharat, and Zeeshan Ayub. This is the first time Sinha and Ayushmann Khurrana, who enjoyed a successful run at the box office with critically acclaimed ‘Badhaai Ho’ and ‘Andhadhun’ last year, will team up for a project. Speaking about his upcoming project, Anubhav Sinha had earlier said, “It is an investigative drama where the audience too is an accused party.” “It is a very challenging film that needed an extraordinary actor like Ayushmann. Delighted to have him on board with an explosive bundle of such talented and acclaimed actors," Anubhav added. Expressing his excitement, Ayushmann, while talking about the film had earlier said, “I’m always intrigued by the socio-political situation of our country. We hardly see films which present the situation in an unbiased way. And it will be an absolute pleasure to work with him (Anubhav) on Article 15." The film is being produced by Benaras Media Works.